MySpace finally launches its new music service this week, mixing up online radio with new ways to discover new music and interact with your favourite musicians. MySpace will offer free (ad-funded) streaming of tunes, the opportunity for users to make up and share their favourite playlists, and the option to buy DRM-free MP3s for keeps via the Amazon MP3 store. The 'MySpace generation' tag is getting a bit old already, with many of the original twenty- and thirty-somethings that sent the social network into interstellar overdrive having already moved on to the quieter pastures of Facebook. "Music has been a pretty big part of MySpace from the beginning," senior vice president of product strategy Steve Pearman told AFP news. "You can do a real business moving away from locking content in and by setting content free," Pearman added, noting that DRM barriers merely result in "people buying less music and turning to piracy." MySpace has partnered with all the four major record labels – EMI Music, Sony BMG Music Entertainment, Universal Music Group, Warner Music Group – as well as devising ways in which to assist new musicians to make money from their music. 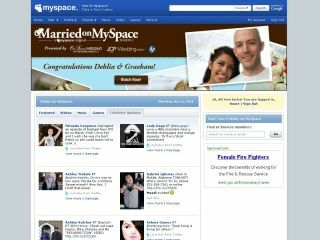 MySpace Music users can store as much music as they like and access it via the web, which is, of course, a major concern to competitors such as Apple. "It's hard to build community around content," noted Pearman, comparing MySpace Music to internet radio community services such as the popular Last.FM. "It is much more straight forward to inject content into community and that is the path we are going down." The service launches in the US on Thursday and will be rolled out internationally soon after. Stay tuned for our fully detailed hands on later this very week.